It wasn't too many years ago that Daniel Boone was one of the best known figures in American history. This was due in no small part to a popular television series about his adventures that featured Fess Parker in the title role. Today, Boone is probably less well known than most professional athletes. This is a sad commentary on current American values, for Daniel Boone was indeed an important figure whose actions truly lived up to his legend. 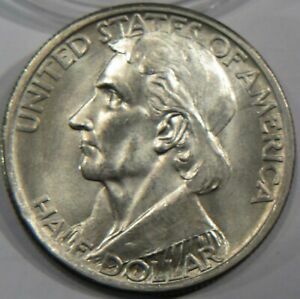 That he should appear on a United States commemorative half dollar seems entirely justified. Of English Quaker heritage, Boone was born in Reading, Pennsylvania in 1734. Just as young Daniel was approaching adulthood, his family relocated to the Yadkin Valley of North Carolina. Married to Rebecca Bryant in 1756, he proved an indifferent farmer but a talented hunter, trapper and general frontiersman. Service during the French and Indian War on behalf of what were then still British colonies was followed by exploration of Florida in 1763, a prize newly acquired from Spain. This region proved disagreeable to Mrs. Boone, and Daniel commenced his explorations of Kentucky during the years 1769-71. At that time, Kentucky was as little known to Americans as the continent of Africa, yet the land held a certain appeal for the young couple. Boone's attempt to establish a colony there in 1773 was foiled by hostile Indians. He persevered and two years later led 30 armed men in the slicing of a trail from Tennessee through the wilderness to a site on the Kentucky River they proclaimed Boonesboro. His forging of the Wilderness Trail soon prompted other settlers to follow. Although some accommodation had been made with the Indians, the coming of the American War of Independence in 1775 challenged whatever sense of order that may have existed. The British Army actively recruited local tribes to harass the Americans in Kentucky. Boone himself was captured by the Shawnee in 1778 and taken to the British headquarters in Detroit. Despite this action, Daniel's proficiency at hunting and his familiarity with the woods was greatly admired by Chief Black Fish, who fashioned for him the name Big Turtle (evidently a compliment!). 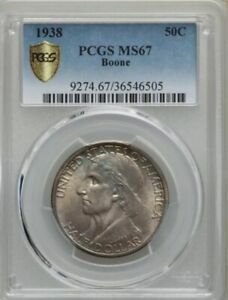 Peace was eventually made between the Americans and Chief Black Fish, an event depicted on the Boone half dollar. Daniel Boone became a distinguished figure in the years that followed, even serving several terms in the state legislature of Virginia (the Kentucky Territory was then within its jurisdiction). The chaos over land titles which followed Kentucky's statehood in 1792 eventually found Daniel and his family dispossessed, hardly appropriate treatment for the region's trailblazer and greatest figure. Resettling in the new wilderness of Missouri in 1799, the Louisiana Purchase four years later again left him without clear title to his land. Recognizing the value of his services to the American people, a grateful Congress saw to it that a portion of his holdings was returned. Daniel Boone lived out his remaining years in relative comfort, dying in 1820, the year that Missouri became a state. 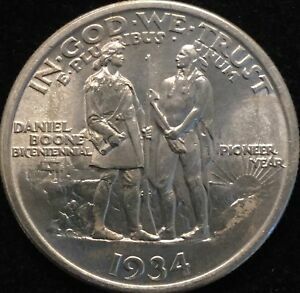 In the late spring of 1934, sculptor Augustus Lukeman was engaged by the Kentucky Daniel Boone Bicentennial Commission to prepare models for its recently approved coin honoring the frontiersman. Their decision led to the first of several controversies surrounding this commemorative issue. It seems that Lukeman was given specific instructions that one side should consist of a portrait of Boone based on Albin Polasek's bust in the Hall of Fame. This Lukeman disregarded, instead adapting his own statue of Boone for the obverse, a portrait which was derived from the frontispiece of a book titled History of Kentucky. His model for the reverse included the elements specified by the Commission, but with historically inaccurate details. When this was brought to his attention by Commission Secretary C. Frank Dunn, the artist became quite defensive and indicated that if the sponsors were dissatisfied, they could return the models to him. An appeal to the Commission of Fine Arts that another sculptor be assigned was rejected on the grounds that Lukeman's designs, while they may have been historically imperfect, were nevertheless satisfactory as works of art. In approving the models, the Commission did, however, prevail upon the artist to make the changes requested by the coin's sponsors. He complied only minimally by removing the dog which had at first accompanied Boone on the reverse. 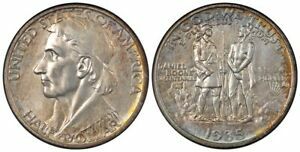 In its determination to see the coins minted before the end of the bicentennial year, the Kentucky Daniel Boone Bicentennial Commission finally ended their protests and accepted Lukeman's models as they stood. 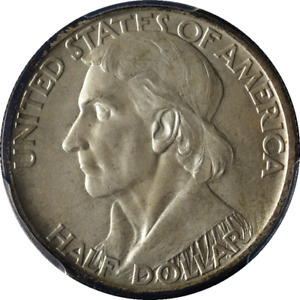 On the obverse is a left-facing portrait of Daniel Boone, appealing yet highly idealized. 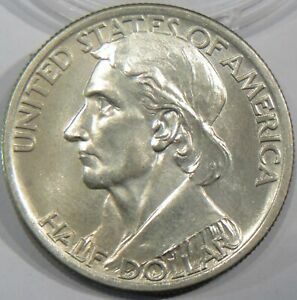 Arranged around the periphery are UNITED STATES OF AMERICA and HALF DOLLAR. On the reverse, full-length figures of Boone and Chief Black Fish face one another against a backdrop of the Boonesboro blockhouse at left and the rising sun at right. To the left is the inscription DANIEL BOONE BICENTENNIAL, to the right the words PIONEER YEAR. The latter is a reference to the date 1934, which appears below the figures on coins minted in 1934 and above the phrase itself on pieces coined during part of 1935 and thereafter through 1938. IN GOD WE TRUST and E PLURIBUS UNUM are arranged around the upper periphery. 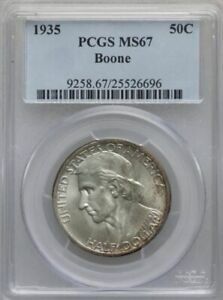 The Act of May 26, 1934 called for the coining of 600,000 half dollars honoring the bicentennial of Daniel Boone's birth. The money raised from their sale was to be used in restoring four historic sites associated with Boone and early Kentucky. There was nothing in the bill which specified the date or mint of coinage, nor was any sales price dictated. Although not unusual in such legislation, these omissions would be exploited to their fullest by the Boone Commission during the commemorative coin mania of the next few years. 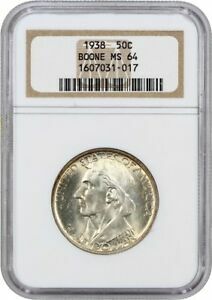 The initial coinage dated 1934 amounted to just 10,007 coins struck at the Philadelphia Mint (the odd seven pieces of this mintage and similar figures for subsequent years represent coins reserved for assay and later destroyed). These were sold at $1.60 apiece by Secretary Dunn from an office in Lexington's Phoenix Hotel. 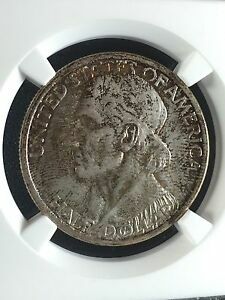 These sold reasonably well, yet a new striking of 10,010 halves from the Philadelphia Mint appeared the following year with the date 1935. 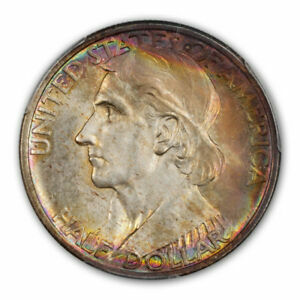 This was followed by Denver and San Francisco Mint issues coined a couple of months later to the amount of 5,005 pieces each. The prices asked were $1.10, $1.50 and $1.50, respectively. 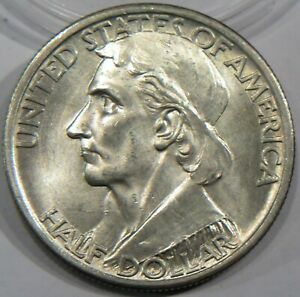 Of course, the reference to a pioneer year was now irrelevant, since that year (1934) no longer appeared on the coins. This was remedied later in 1935, when a small date 1934 was added above the inscription PIONEER YEAR per new legislation dated August 26, 1935. 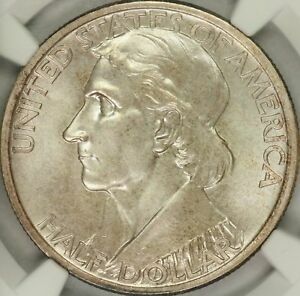 10,010 examples of this variety were struck at Philadelphia, but the Denver and San Francisco Mints coined only 2,003 and 2,004 pieces, respectively. Highly publicized as rarities by Secretary Dunn, these were offered at a cost of $3.70 for the pair. Collectors were surprised by this development, and some a little annoyed, yet they had no choice but to order this extra issue if their sets were to be complete. Dunn, claiming that the offering of 2,000 pair had been oversubscribed, returned most of the checks sent him. 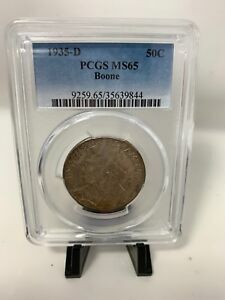 Collectors and dealers quickly sensed that a fraud had been perpetrated against them, as so few persons received their coins from the Commission, yet a handful of dealers, Dunn included, just happened to have some available at their new market level of up to $50 for the pair! 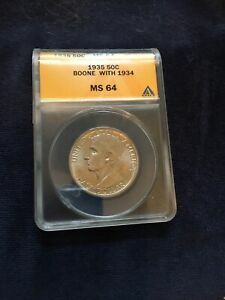 This episode set the tone for future offerings of this and other "serial" commemoratives of the mid-to-late 1930s. 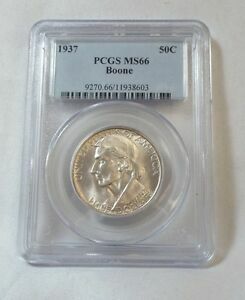 With nothing to prevent further coinings of the Boone halves, new editions were put out annually in three-piece sets through 1938. Both prices and ordering options varied from year to year, creating much confusion and resentment. 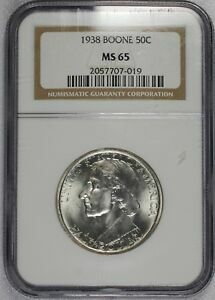 Congress finally put an end to this abuse in 1939 with the passage of a bill prohibiting the further minting of any commemorative coins authorized prior to that date. Boone halves are found with a number of differing surface textures and a wide variance in luster. Some are prooflike, some have a chrome or satin finish, and a number will display dull, semi-matte surfaces. 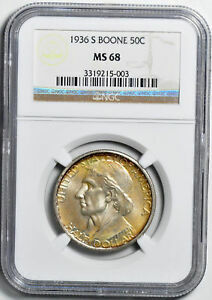 Conventional, frosty luster, with its accompanying "cartwheel" effect, is primarily limited to the Philadelphia Mint issues, although there are a few exceptions. Most pieces are well struck, yet weakness may occur in the Indian's head and hand. All of the dates within the series seem to be available in grades up through MS-65, but their numbers drop off quite a bit at higher levels. 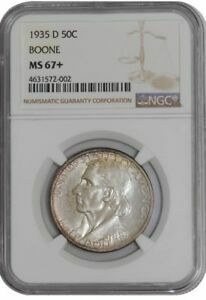 Coins struck in Philadelphia from 1934 through 1937 were often sold to the general public, and such pieces, particularly the 1934 issue, may show signs of mishandling. 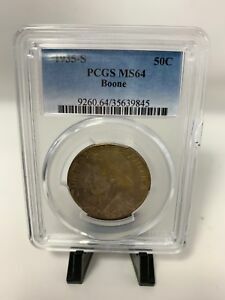 The branch mint halves are more often found choice. 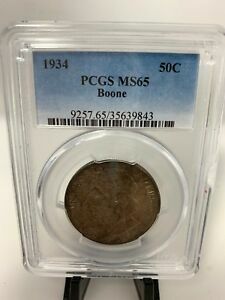 The first signs of wear on the obverse will appear on the hair behind Boone's ear; on the reverse, check for wear on the shoulder of Black Fish. 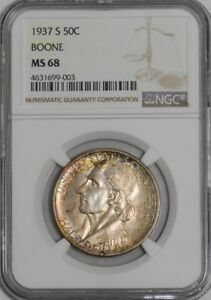 1935 BOONE COMMEMORATVE SILVER HALF DOLLAR WITH 1934 ANACS MS 64.